Neil Young: "Pono is the same as the iPod but it sounds like God" | What Hi-Fi? Neil Young: "Pono is the same as the iPod but it sounds like God"
"If you can’t hear the difference or don’t want to, I don’t force this on anybody." Neil Young talks MP3, high-resolution audio, his Pono Music project and what Steve Jobs would be doing now. Neil Young's Pono project is gathering momentum, with the PonoPlayer going on general sale as the Pono Music store launches in the US. So it's no surprise Young is ramping-up the rhetoric around the high-res music system, too - even if some of his own company's executives reportedly aren't quite so convinced. 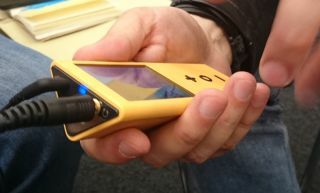 Young, speaking at CES 2015, was bullish about the performance of his portable player (to put it mildly), but revealed he didn't mind if people said they couldn't hear the difference. "Truly if you can’t hear the difference or don’t want to, I don’t force this on anybody. I just think what we’re doing is playing real music for as many people as possible," Young said. "If you don’t care and you don’t want want to hear this music and ask, ‘Why’s he doing that, we got MP3s and iPhones?’, then I feel good for you people, you have nothing to worry about. Congratulations, all those MP3s are yours." Young suggested MP3 was from a bygone age and that high-res audio had meant he's been able to listen to music again. "MP3 is doing OK considering it was designed for dial-up modems but we just couldn’t stay there. Pono is the same as the iPod but it sounds like God," Young said, while praising the skills of Charles Hansen of Ayre Acoustics and designer Mike Nuttall, who have worked on the project. "When people ask me ‘do we need high-res music?’ I really don’t know. I can’t tell you but I know for me - I can listen to music again. I didn’t listen to music for the last fifteen years because I hated the way it sounded and it made me pissed off that I could not enjoy it anymore." However, we're not sure why he couldn't have been listening to vinyl all this time, seeing as he also professed his love for that format - which has seen a well-publicised revival in recent years - while also squeezing in a dig about CD. "We had vinyl and that was good, then we went to CD. Wow, that was an amazing drop – it was like, ‘What happened to the air, where did it go? What happened to the magic? What happened to the warm fuzzy feeling?’. Well, I’ll tell you what, some people thought CDs were better because you could play them louder." This touches on the issue of mastering and the quality of the recordings, which many people argue is more important than the bitrate. While many remain sceptical about Pono, Young says he's prepared to play the long game - and he's confident. "We don’t have to have success in three hours and make billions and retire in six months. We need to slowly absorb the process of letting people hear real music through a real music player. I think people are going to love it." And the final confirmation? He's sure that Steve Jobs, who knew a thing or two about how to sell digital music players and digital music, would be on board. "I’m convinced Steve would be doing this now if he was still here because he listened to vinyl in his own house, he had a nice set up in his living room." You can read our PonoPlayer hands-on review for our initial impressions of the player - look out for a full review soon.